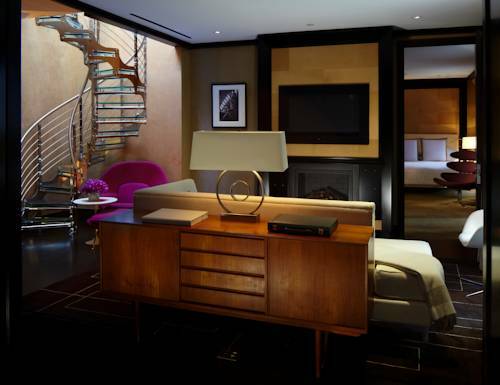 Voted the #1 Best Hotel in New York City by the 2018 Conde Nast Traveler Readers Choice Awards.In the heart of Manhattan, most conveniently located on 44th Street, The Chatwal, New York is steps from the best of entertainment, dining, shopping, Broadway theaters and the citys media and financial giants. This beautiful landmark hotel built in 1905 by Stanford White has been restored and renewed by master architect Thierry Despont, re-launched in 2010. The Chatwal s 76 keys includes 29 stunning Suites and 14 themed suites with spacious designer terraces as well as bespoke services including a team of professional Butlers, 24-hour in-room dining and distinct private bars. The Lambs Club Restaurant & Bar: Celebrity chef Geoffrey Zakarian heads up our fabulous Lambs Club American-style restaurant, featuring gorgeous dark paneling, swanky red booths with white tablecloths, Art Deco light fixtures and a large 18th Century French fireplace.